Can be used on almost any surface, including granite, metal, wood, glass and electronics. Removes dust and up to 90% of the allergens found in dust. No smeary residue. Jasmine scent.Pledge Multi Surface Furniture Polish does the work of a variety of household cleaning products. This all-purpose cleaner contains a worry-free formula that cleans up smudges and messes while safely leaving the finish alone. 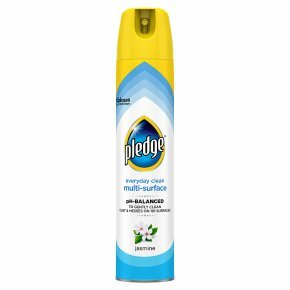 Pledge Multi Surface Everyday Cleaner also removes dust and up to 90% of the allergens found in dust.